It must have something to do with getting older but the older you get the faster time seems to fly by. I’m pretty sure I just got married only a few years ago or at least JUST gave birth to my sons. But somehow I’m already celebrating my 10 year wedding anniversary with my sweetheart and wishing a happy birthday to my 3 and 7 year old boys. Although I really enjoy how as your children grow up their skills and personality develops too. And one thing never seems to change, little kids (especially 2-3 year olds) enjoying being independent. That is the case with my now 3 year old. It’s amazing, interesting and sometimes humorous to watch his mind work and see how he figures things out. Sometimes simple thing like opening and closing a latch or a filling up a bottle with tiny objects can fascinate him for almost 30 minutes. And with a 3 year old- almost 30 minutes is GOLD! So, here’s what happened a few weeks ago. The doorbell rang and both my boys ran to the door and quickly informed me that there was a HUGE BOX outside! Upon further inspection they inform me that it’s an Ohio State wagon from Step2, and as my 7 year old told me, “we like Ohio State AND we live in Ohio!” (He has even told a few strangers when we are on vacation when they asked him where he is from, “I’m from Ohio State.” Not quite buddy, but close.) A few minutes later the wagon contents of the box are strewn across the living room and my 3 year old tells me at this point, “don’t worry Mama, I help you make it.” Thank goodness, crisis averted, I won’t have to put together this easy to assemble wagon by myself. Instead it will now take 2 times as long now because he will promptly carry pieces off as he tries to help. At least his heart is in the right place and he’s willing to help. After about 45 minutes and a hunt for a hidden wheel the wagon was completed and my helper now had decided to sit in the wagon.. inside the house.. in the hallway… where it won’t turn the corner because of how he has it wedged in. Being completely honest, we had a wagon already, but when Step2 asked me to review their Ohio State wagon I just couldn’t turn down the chance to review an OHIO STATE wagon! I already had my opinion of our current Radio Flyer wagon. It has two little seats and buckles, it’s simple but that didn’t bother me and I honestly liked it. Well, after several minutes of watching my “helper” easily open the door, close the door, sit down, hide his cup in the cubbie, then use the cup holder I realized how much better I LOVED this new wagon. First, the door; it has a DOOR; our Radio Flyer wagon has no door so there is always my fear that some child will flip the wagon trying to get in or out because they have to climb over the side to get it. It opens and closes easily and that alone was fascinating to my son. Then there are 2 cup holders. Not just 1, so the two kids inside have to fight over it- TWO cup holders- everyone gets their own. And the little storage compartment in one of the seats is just the right size for a diaper or wipes so that you don’t have to worry about carrying them or even worse- forgetting them! And the “best” part? it’s scarlet with a cute little grey door and the official Ohio State logo right on the front! To be an Ohio State fan with a wagon that gets people to cheer OH-IO or GO BUCKS what could be more fun?! Oh and the HUGE box, if you have kids you know how much fun they can have with any box. Well the box had it’s few day in the sun - until trash day. But my boys did play pirate hideout in it and my youngest even tried to convince me that it was his new Ohio State bed. Hmm, an Ohio State bed.. maybe that’s something else new that Step2 could work on. I’ll keep you posted if I hear anything about that next! 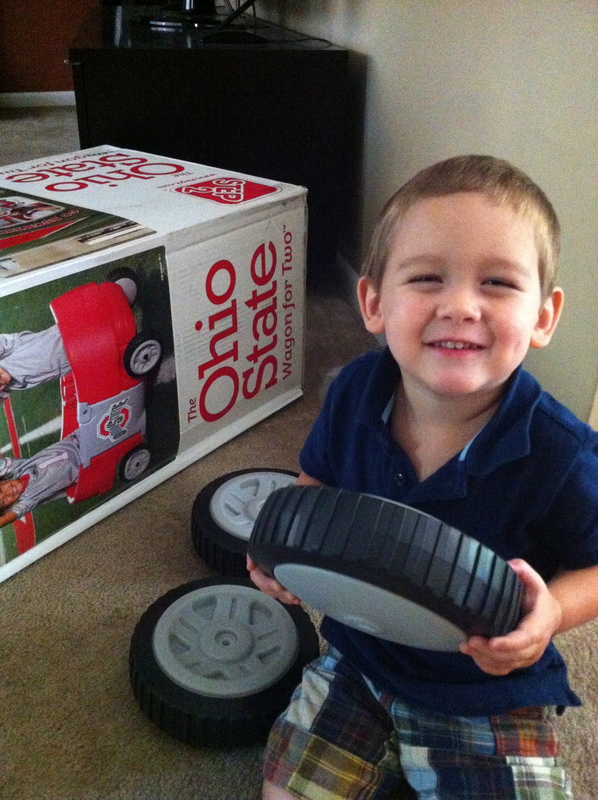 Disclosure: Step2 sent me the Ohio State wagon and box that my kids played in to review. But this post and the opinions belong to me and were not paid or influenced by their product. Okay, for all you lovers of Trader Joe’s, I think you are going to like Earth Fare supermarket! Tomorrow Wednesday, October 19 Earth Fare is having their grand opening at 8am. They are located at Cross Pointe Center, where the old Stitching Post was. While they aren’t having any grand opening freebies tomorrow (see I knew what you all are were hoping) they have something better going on every week. Earth Fare has Kids Eat Free every Thursday from 4-8pm where kids eat free with an adult entree purchase of $5 or more. But here’s what makes their Family Dinner Night so great, there is typically entertainment for the kids (read: clowns, balloons, crafts..etc), your kiddos get to choose what they eat and up to 6 kids can eat free with a $5 adult entree purchase! This is a great deal for those of you with larger families. They make their kids menu even better by having a high standard for their products. And just like everything else in their store including dairy products, snacks, wine, cheese and even dog and cat food there are certain things they don’t use. So you can enjoy your favorite snacks and staples without unhealthy ingredients like High Fructose Corn Syrup, Artificial Fats, Artificial Trans Fats, and Artificial Sweeteners. There is a huge section of bulk food and you can even bring in your own containers, just be sure to stop by the front desk when you come in so that they can weigh it so you don’t pay for the weight of your container (how cool is that?!?). Be sure to sign up for their weekly freebies/coupons and deals. I’ve been receiving them for about 3 months now and I’ve received ones for Free 1lb of Chicken (or Veggie Burgers) with $10 purchase, free 1lb of grapes with any purchase and free Earth Fare brand cookies with any purchase.. those are just a few of the coupons that I’ve gotten already. So make sure you sign up and you can get these great deals too. They also have coupons in store, they hand out coupon booklets when you come in and there are even coupons on their site. For those of you that are like me, you can even show them your coupons on your electronic device so that you can save paper, or just copy down the PLU code for your coupons. Plus be sure to follow them on Facebook for events and promotions. Personally I’m really excited to actually grocery shop there, and I’m almost positive that we will be going to Family Dinner Nights on Thursday! 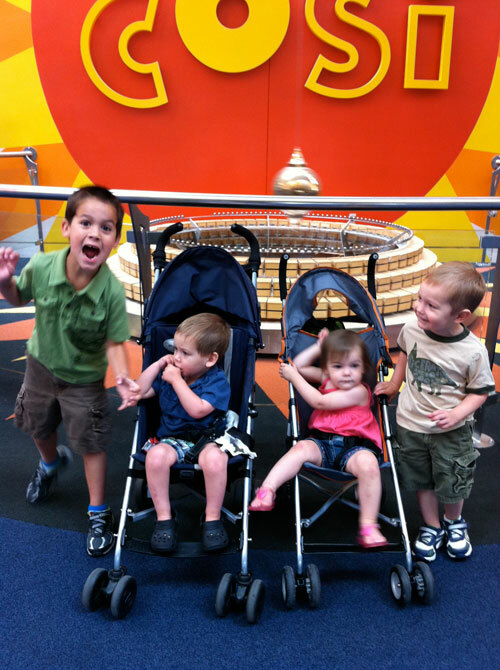 Most parents know that mixing a toddler and a long car trip can be a recipe for disaster. When we headed to the beach this summer we decided that our iPad 2 was a perfect way to help pass the time for our 2 year old on our 12 hour drive. Our problem is that we don’t have a in-car DVD player, we really wanted to use the iPad2 so that he could watch a cartoon or two on our way there. So, we headed to our ever trustworthy friend, Griffin Tech to see what options they had available. Our result? The CinemaSeat. 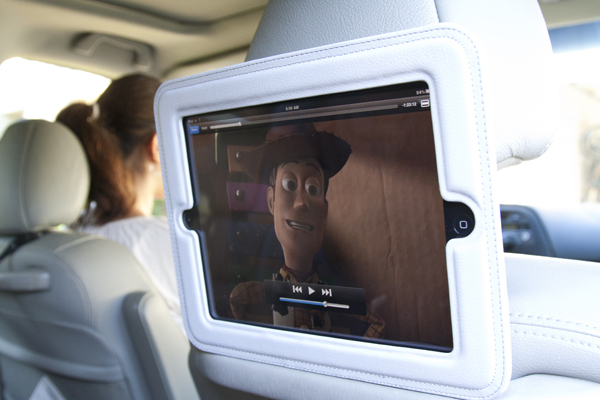 This simple case helped turn our iPad into the best in-car entertainment system that our van had ever seen! Several access points that make it easy to reach the volume, headphone jack and other buttons while in the case. While it sat nicely on the headrest it was a little difficult for anyone not sitting directly behind the CinemaSeat to see the screen. This isn’t a fault of the CinemaSeat but more an issue with the shape and size of the iPad screen. Although I like how easy it was to put the iPad in and out of the case when it was in use. Since we have a Honda Odyssey we were able to balance the case on the hand bar on the back of the seat it was attached to. I did wonder how high or low the case would sit in a vehicle that doesn’t have anything to support the bottom of the case. 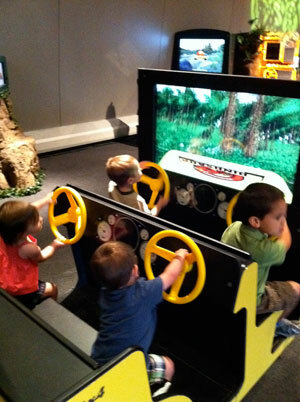 If I could make one change I wish that there was a way to strap the case between the driver and passenger seat so that we could use it in the middle so that both kids could easily see the screen. My conclusion: with it’s solid Griffin frame it is the perfect option for our DVD-less van, or any DVD-less vehicle for that matter. It makes it so that our kids can easily watch a movie while we travel and with the headphone jack readily available it’s nice to think that I really don’t HAVE TO listen to them watch another episode of Chuggington again (while in the van at least). So, if you are also DVD player-less in your vehicle for only $25 on Amazon.com the CinemaSeat is a perfect option. Trust me we’ve tried the “shoestring” option too, but now this way I can rest assured that our iPad is secure! On a side note, I also like that we can easily use this in any vehicle that we want and all we have to do is strap it onto the headrest and we are set. PS- Please notice that we are watching the much loved Toy Story movie on our iPad snug inside the CinemaSeat. Disclosure: Griffin Tech provided me with our CinemaSeat mentioned above. But this post and opinions are my own and not paid for or influenced by the item provided. To read their reviewer policy be sure to check out http://bit.ly/griffinreview. CLOSED: This giveaway is now closed. Congrats to our winner Abby. 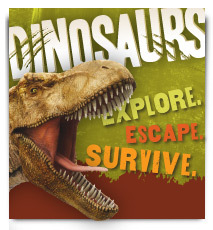 I know it’s early but I’m already thinking about what I’m going to be doing for the boy’s birthday. And with birthdays come friends and family, gifts and thank you cards. So when I got my set of custom designed thanks you cards from Paperreka I could not have been more excited! Now, I’ve bought and received my fair share of cards over the years, but I’ve never seen any that were as beautiful as these. Her slogan of “you need custom (+) I breathe design (=) together, we are paperific” is so fun too! I had asked Paperreka to match the card to my website, and I cannot believe how incredibly close they are! Now, if I had been REALLY smart I would have made them match the theme of our birthday party, but I’m not THAT on top of it. First the box had all the card nestled inside a clear plastic case and tied sweetly with a ribbon. Then each card has the look and feel of wood, it’s amazing! Her website and all of the products that are on it look just as breathtaking. I love how each product has a catchy spice or herb name too, and with fun names like Juniper Berry, Cocoa Nibs and Fenugreek it’s hard to not want everything on the site! The site if full of beautiful products; and wouldn’t you know it, their options not only beautiful, but are custom designed for your specific needs. The sophisticated Red Pepper monogrammed cards are classy and classic. So are the Vanilla baby birth announcement cards, which would be sweet for a thank you card from the baby. Well, here are some more ways you can enter, just be sure to leave a additional comment for each additional entry requirement that you fulfill. - Follow Deals For Dayton on Facebook, if you already do- tell us in your comment. - Subscribe to our weekly email newsletter, if you already do- tell us in your comment. This contest ends Thursday, May 19, at midnight EST. We will use Random.org to pick our winner. Disclosure: Paperreka provided me with two sets of custom designed thank you cards. But this post and opinions are my own and not paid for or influenced by the item provided. 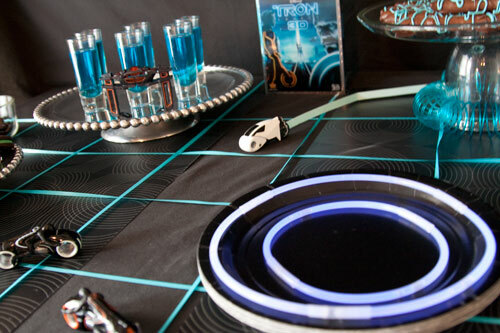 I’m so excited to share our Tron party with you all! C was so excited when Tron finally came out on DVD. We had promised him that we would have a little Tron party for him, we even invited a couple friends over to make the party even more fun. Here are my favorite details: Grid Pretzel sticks and Identity Disc glow sticks. 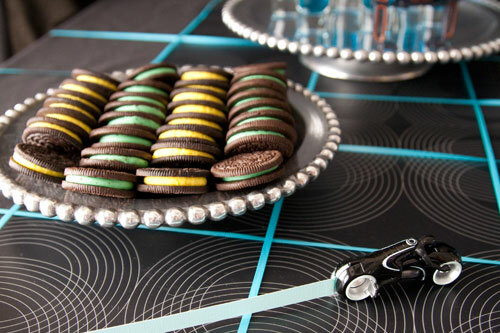 Tron Legacy Movie night was upon us and I wanted to make the night more exciting than just watching the movie. We taped bright blue strips of curling ribbon across the table to help us create the Grid, and then used our Ikea Placemats to help make the Grid look even better. Glow Sticks were made into two different size rings so when they sat on the plate stack they looked like Identity Rings. We have a few of the Light Bikes already so I cut strips of scrapbook paper to look like light streams behind them. It turned out pretty awesome! Little Slinkys were wrapped about the base of one of the food stands to look like light streams. Oreos- Springtime and Mint Oreos looked like Identity Rings, I considered using regular Oreos, but found yellow springtime ones. Chocolate Covered Pretzel Rods- We dipped them in chocolate and then drizzled blue chocolate on them so that it looked like the grid. 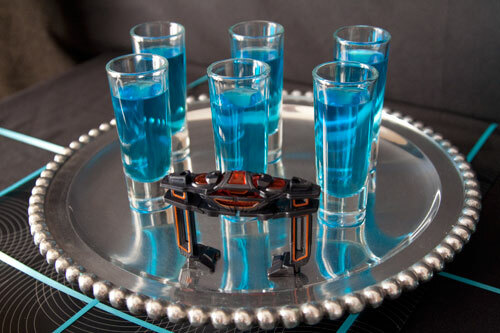 Blue Drink- We made blue raspberry Kool-aid to look like the blue drink that they have in the bar. Not pictured: Guacomole and Blue Corn Tortilla Chips. I had TONS of other ideas, but figured that since it there were just 5 of us that I didn’t want to go overboard. Besides we are STILL eating Oreos and pretzel rods. I’m linking up over at The Diaper Diaries for Things I love Thursday. We don’t have cable at our house. I’ll be honest though, if we did I would be a LAZY Mama and watch way too much TV, plus I’ll admit it- I’m too cheap to spend the money on it. That said, we watch PBS for most of our kid’s entertainment. I really like the cute little Stevesongs in between shows, they are fun little sings about science, friends, shapes and tons of other stuff. This week I discovered that Steve Roslonek (Stevesongs) has a CD called Marvelous Day. After a little research I realized that the Washington-Centerville Library and Dayton Metro Library both have a copy of the CD. So, I packed the boys into the car (in-spite of the rain) and we trekked to the library to find the CD. I am contemplating getting his other CD Music Time with Stevesongs that has the songs that he sings on PBS. I love that “RainKeeps Falling Down” song! Don’t you love it when you meet someone new and just talk to them for hours and not even realize how long you’ve been talking? That’s what happened with me when I met Daina the owner of Jenna Claire Handbag Studio. We had a great time talking about all the fun things that they have in their store, and honestly about 100 other things too. There are so many things at Jenna Claire that I didn’t even know that they sold! Besides their main feature of Design Your Own handbags and accessories they also carry Baule Lulu beads, S.T.A.M.P.S. watches, FUMI purse hangers and more. I was so excited when I got to “test drive” a FUMI Bracelet PurseHook. I’ve had a purse hanger before, but nothing like this one! It is actually a bangle bracelet and purse hook fused into one fun design. It can hold up to 25 lbs so it can hook more than one purse at a time easily. I wore mine for a few days as a bangle and it was a little clunky, but I do have little wrists and I don’t typically wear big jewelry either. You can use the Bracelet PurseHook where ever and when ever you want to set your purse down. You can use it on a restaurant table, restroom stall door, school desk and then when you pull your bag away the hook nicely pulls off and closes around your straps so that you don’t have to worry about taking it off and putting it back in your purse then not being able to find it next time you need it. Because really do I need ONE more thing to keep track of?! Now I’m pretty purse loyal I have my Coach handbag and that’s is really all that I use. So you might be thinking what am I doing writing about a place that makes custom designed purse if I use only one brand of purses. Well, Jenna Claire has so much more there than just handbags. Besides their top sellers like the It’s a Cinch, Brooklyn handbags and diaper totes they also have lunchbags, camera bags, camera straps and my current favorite- purse organizers. I always have at toys, snacks, tissues and all those mommy things in my purse and it takes me WAY to long to find just about anything in it so, they suggested that their purse organizer would be perfect for my needs. 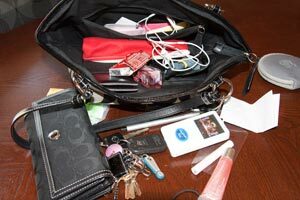 It is the ideal solution for my messy purse but I can easily use it with any purse. When I need to switch bags all I need to do it pull my organizer out and place it in my new purse, diaper bag or gym bag. 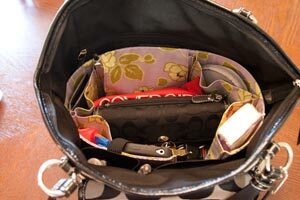 The organizer makes purse and bag changes quick and simple. 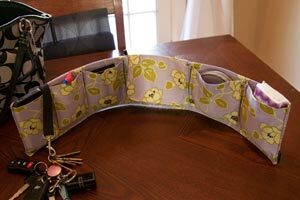 It has just enough pockets for all the little things I need, a Velcro pocket and key clip. The purse organizer is sold in 3 different sizes and can be custom made with any in-store material or you can choose from their pre-made organizers. I personally picked a fun purple fabric and am very happy about how cute it turned out. It’s made with stiff material so that it helps keep the shape of your purse and works like a “bra” for your bag. What I’m excited about besides helping my purse stay organized and making it easier to find things it will help keep my purse fabric stay cleaner too. Here is what I think us awesome about Jenna Claire, it is a locally owned and operated store. Every item in store is cut and created by local seamstresses. To me that alone is a GREAT reason to support Jenna Claire. So next time you are at The Greene be sure to check out Jenna Claire! Want to see more pics of their custom products? Be sure to “like” Jenna Claire on Facebook and check out all their great deals and products! While you are there be sure to tell them what you think of my new organizer. Disclosure: Jenna Claire Handbag Studio provided me with all the products mentioned above. But this post and opinions are my own and not paid for or influenced by the goods provided.